Vada Pav is vegetarian ‘peasant-style’ food from Maharashtra. Pav is an unsweetened bread which looks a bit like a soft bread roll and Vada are a version of potato patties. Fine cut chillies, ginger and a phodani (oil heated with mustard seeds and turmeric) are added to seasoned mashed potatoes. This mash mixture is dipped in herb-seasoned batter made with gram flour and deep-fried. Serve the Vada in the Pav and top with chutney – traditionally made with shredded fresh coconut, tamarind paste and garlic. Other variations include a cheese vada pav (with cheese added), or even a samosa pav. Aloo Tikki are North Indian snacks made of boiled potatoes and spices. The potatoes are mashed, mixed with herbs like coriander and spices, and pan-fried. They will often be served with a curry and chutneys. In North Indian dhabas (food stalls/truck stops) they often sandwich aloo tikki in bread and serve it with mint and coriander chutney or tamarind chutney. Pav Bhaji is a thick potato and vegetable curry garnished with finely sliced onions, coriander and a lemon wedge or two. It’s served with a Pav and comes in a variety of versions – for example, cheese pav bhaji with cheese added, mushroom pav bhaji, and even a version that has been slightly sweetened with the addition of some dried fruit. Puri is a type of deep fried flaky bread, usually round, and they come in a variety of sizes. Discs of bread dough are pan-fried in deep oil and as they cook, they fill with steam and become puffed up and golden brown. Alternatively, prick them with a fork before putting them in the oil and they cook like flat breads. (Look up ‘making puri’ on Youtube to see how they are made if you fancy having a go at making them). Puri can be served hot or cold and are often served with a korma, chana (chickpea) masala, dal or halva. Sweet varieties are also made and include shrikhand (sweetened strained yoghurt mixed with spices like cardamom and saffron), or fresh or dried fruit. Dahi Puri are small bite sized puri that look like large profiteroles and are normally served six per portion. The puri are loaded with diced spiced potatoes, onions, three types of chutney (garlic, chilli and tamarind), drizzled with yoghurt, and topped with Sev, which are crunchy spiced noodles made from flavoured chickpea (gram) flour paste and are similar to what you find in Bombay mix. 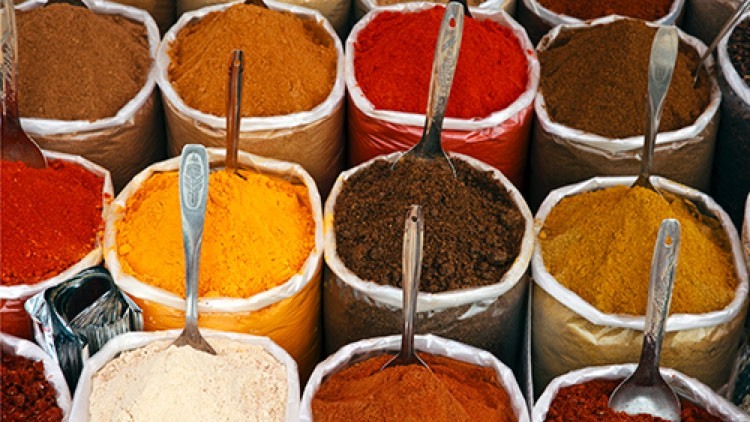 These are some of our favourites, we’d love to hear what your favourite Indian food is.